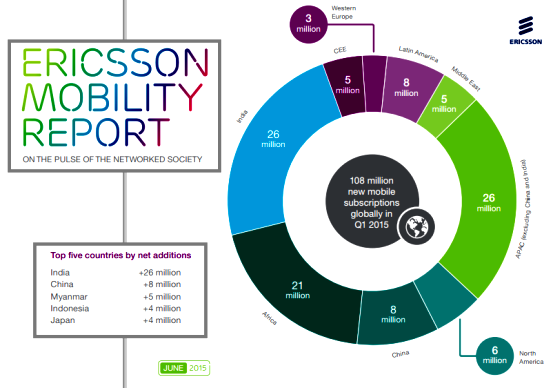 As per the latest report released by Ericsson, India has shown the fastest growth in the net additions of mobile subscribers followed by China. According to the report, India added at least 26 million subscribers at a time when the total number of mobile subscriptions in the first quarter of 2015 touched 7.2 billion, including 108 million new subscriptions. Following India is China with a net addition of more than 8 million subscribers. Myanmar tops the chart next with more than 5 million additions. Indonesia and Japan listed around 4 million subscribers each. The increase in number of subscribers is a result of increasing smartphone penetration. The report also said that, around 70 percent of world's population will have smartphone by 2020. The smartphone subscriptions will become more than double, and reach 6.1 billion by 2020. The report also predicted that, the data usage will also grow at a much faster rate, as much as 10 times as of now, due to the anticipated surge of smartphones. Around 80 percent of all mobile data traffic will come from smartphones. In addition, at each year until 2020, mobile video traffic will grow by 55 percent yearly and will constitute around 60 percent of all mobile data traffic by the end of that period. Tablet users spend 50 percent more time watching videos online than average mobile broadband users. Dear readers, please share your views and opinions about this latest report via comments with us.